This one was brought to my attention back in January of this year, but unfortunately I was busy with other things and didn’t take the time to write it up. However, having dealt yesterday with a quote that purported to be from the Buddha but was actually from a work attributed to Seng-Ts’an (Jianzhi Sengcan), I was prompted to look again — for Seng-Ts’an has returned! The moment we are enlightened within, we go beyond the voidness of a world confronting us. This quote is actually from the 20th well-known century Japanese scholar DT Suzuki’s translation of Seng-Ts’an’s “On Believing in Mind” (Hsin-Hsin Ming). You’ll find it in his 1935 “Manual of Zen Buddhism,” page 78. This terminology is much more traditionally Buddhist—or at least Mahayana Buddhist. “Appearance” is how things appear to the unawakened mind: separate, apparently real, and having some kind of essence. “Emptiness” is shunyata,” which here means “lacking in self-nature.” In other words, although we may think of objects (ourselves included) as really existing, separate from the world surrounding them, and as having some kind of essence that is their real nature, they’re not like that at all. All things are dependently arisen on the basis of other things. Nothing is separate. At least that’s the Mahayana take. “Insofar as it is empty of a self or of anything pertaining to a self: Thus it is said, Ananda, that the world is empty. And what is empty of a self or of anything pertaining to a self? The eye is empty of a self or of anything pertaining to a self. Forms… Eye-consciousness… Eye-contact is empty of a self or of anything pertaining to a self. Compared to Seng-Ts’an, the Buddha’s saying something a bit different and more specific here: that none of the six sense objects (mind objects such as thoughts and memories being the sixth), their respective organs (mind again being the sixth), and the aspects of consciousness that are aware of them, are oneself. The Buddha was encouraging us not to define ourselves in any way. You are not what you’re aware of. You’re not what’s being aware. You’re not even the process of awareness. Trying to pin down what you are only leads to “self view,” and the Buddha said he saw no self view that would not lead to suffering. So, the message is, stop trying to define yourself or to identify anything as being yourself, and thus let go of your most fundamental mode of clinging. In the Phena (“Foam”) Sutta, the Buddha takes each of the five khandhas, or “accumulations” that constitute the mechanism of experience, and says that each is empty. Here’s what he said about the khandha of form (rupa). Monks, suppose that a large glob of foam were floating down this Ganges River, and a man with good eyesight were to see it, observe it, and appropriately examine it. To him — seeing it, observing it, and appropriately examining it — it would appear empty, void, without substance: for what substance would there be in a glob of foam? In the same way, a monk sees, observes, and appropriately examines any form that is past, future, or present; internal or external; blatant or subtle; common or sublime; far or near. To him — seeing it, observing it, and appropriately examining it — it would appear empty, void, without substance: for what substance would there be in form? The other four khandhas — feelings, perceptions, volitional tendencies, and consciousness — are described using different images, but they’re treated identically. This has a very similar feel to Seng-Ts’an’s statement (at least in the Clarke version), although Seng-Ts’an’s Mahayana perspective is that we need not just to see the emptiness that lies behind appearances, but to go beyond both appearance and emptiness. I don’t think this is something that the Buddha ever explicitly suggested, although perhaps it’s implied in his teaching. Thanks again to John Foley for passing this one along. 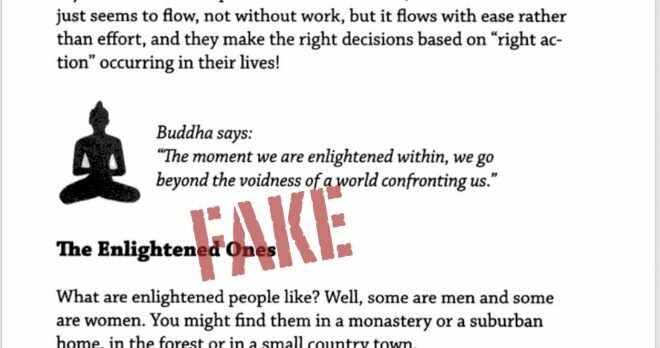 Next Next post: I can’t believe it’s not Buddha!